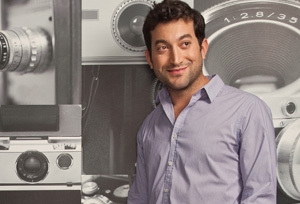 Jon Oringer, founder of billion-dollar image company Shutterstock, on staying one step ahead. The founder of New-York based Shutterstock on taking the company public, managing 40,000 contributors, and why he's not afraid of Instagram. Jon Oringer started stock photography marketplace Shutterstock in 2003, after noticing there was a severe shortage of quality photos available to businesses for their websites and marketing material. He started by uploading 30,000 of his own photos to the internet on a subscription basis, but quickly found he wasn’t able to keep up with demand. More than 40,000 photographers now contribute to the website, 300 million photos have been sold, and Shutterstock operates in 150 countries. In October 2012, Shutterstock became the first tech firm to go public on the New York Stock Exchange since 2010. Floating at $17 a share, its shares are currently worth around $45, giving the company a market capitalisation of around $1.5bn. Oringer, who still owns just over half of the business, talks to MT about staying one step ahead in the fast-moving world of tech. Why did you launch Shutterstock? I started Shutterstock out of my own need. I’d previously created a few software companies, and each time I struggled to find affordable images to use on my websites. Other image libraries at the time were offering licences which varied in price per picture and had different terms and conditions on the use of a photo. It was all very confusing. I figured that having a library where you come in once and grab whatever you needed at a set price would make things much easier for businesses. I put 30,000 of my own photos on the website and created a subscription service. Soon I was struggling to keep up with demand so I opened up the site to other contributors, and we now have more than 40,000 working for us. Every time someone downloads a picture, the photographers get paid about 30% of what we charge. I didn’t take any venture capital at first, although I eventually raised finance through private equity. It wasn’t really about the money though – I wanted to build a management team and I needed advice. I wanted a CFO with public company experience; I needed an HR department, new office space, and a board which could help me grow the business. Insight, the private equity firm I chose, helped me with all that. It took us three years to build the executive team, but it’s something you really need to get right. I now own just over 50% of the firm, Insight owns 20%, around 14% was sold on the IPO and the rest is owned by employees. Why did you go public? Listing on the stock exchange has helped us plan for the long term. Video footage is the fastest growing part of the company, so we’re investing money in that at the moment. We’re also launching a new service called Offset, which gives users access to a high-end collection of photographs for a premium subscription. By going public, we now have the resources to do this type of stuff. It shows we’re thinking seriously about our future and rivals like Getty know we’re here to stay. Why are you based in New York? I went to College in New York (Stony Brook), so it made sense for me to start the company there. New York generally isn’t a place where people think to start a business, but I think that’s changing. For Shutterstock it’s great because we’re so media focused and New York is the advertising centre of the US. New York also has the diversity. We answer the phone in 10 different languages, so we need to hire people from lots of nationalities. How do you view businesses like Instagram? Is it a threat to your business? Or is it something you can work with? Instagram is great for us because it’s encouraging people to shoot more stuff. Some of those snappers will become professional, and they may choose to sell their photos through us. Instagram’s relationship with its photographers is different to a commercial photography business. At Shutterstock we review all 20,000 images that come in every day. We’ve paid out $150m to our 40,000 contributors over the past nine years. How do you monitor people copying your images illegally? People can’t download Shutterstock’s images in full resolution before they buy it, and all our images are watermarked. Also, all our contributors are monitoring their work and new technology has made it easier for them to track who is using their image on websites. If someone’s using a licence they’re not supposed to, people will find out pretty quickly. The US needs more engineers, although we’re not the only country suffering a shortage. Shutterstock has sponsored workers from abroad to come to the US, but it’s still tough to find the talent. The world’s moving fast, and we’re trying to develop new things all the time to keep up with that.